This was the main Belfast to Carrickfergus road in 1936 which ran right through Whiteabbey. The four boys looking at the camera are all barefoot and behind them was one of the many churches in the village which included as many pubs if not more! 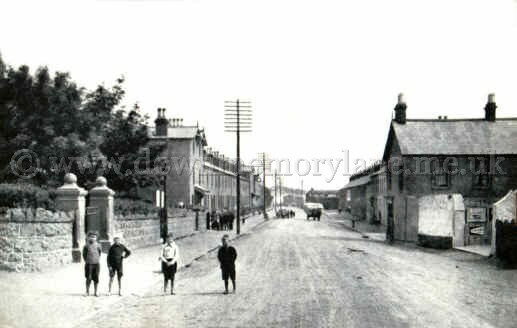 The horse and cart coming towards you has the bales of linen from the mill and the houses to the left were the workers houses with a clock in the middle of the block so they would not be late for work. In the background are the coal sheds for there used to be a pier for the boats to unload the coal thus saving journeying to Belfast.